Whether we like it or not, The Witches is getting a remake. We're gonna set it in the Gothic South in the 1960s, and that's an exciting way to kind of put a sociological spin on this kind of traditional witch story. On paper, that sounds like an exciting way to update a familiar story, but there are potentially troubling implications. With the recent announcement that Anne Hathaway will play the Grand High Witch, the main antagonist, Zemeckis is setting up a world where witchcraft is inherently tied to racism. After how far we've come with the symbol of the witch, it feels reductive to align a group of women with a faction of humanity that detests anything "other." Witches are the other; if anything, they'd likely support the Civil Rights movement, championing the persecuted as they're also on the other end of the societal pitchfork. It also feels like a backwards time to indulge in a film where witches are evil figures at all. As Kate Guadagnino wrote for the New York Times last year, "women—often those already on the outside, such as the poor, the old and women of color—have a very real history of being accused of witchcraft and suffering greatly." Because of this, witches have a big presence in modern feminism. 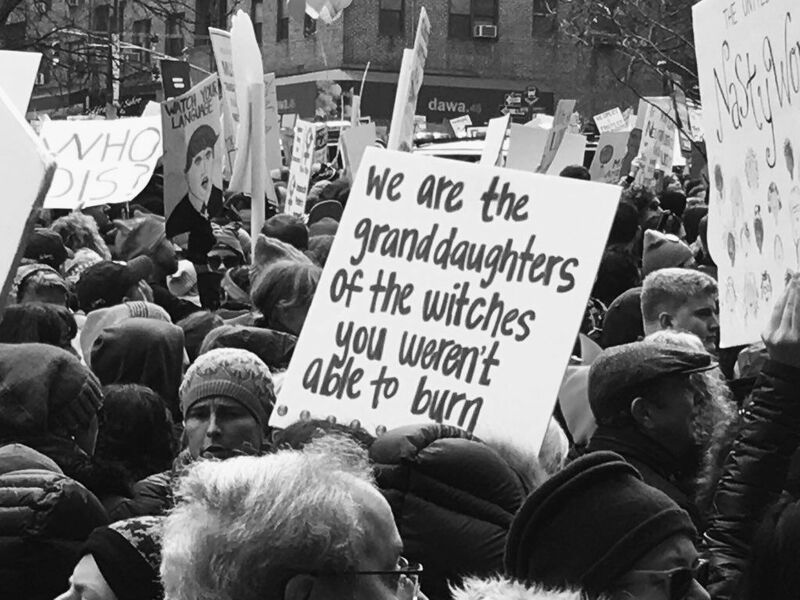 "We are the granddaughters of the witches you weren't able to burn" read signs at the first Women's March. Sisterhood and a connection to nature are powerful tools for women living in the confines of the patriarchy. And in return, recent media—like The Witch, The Love Witch, The Chilling Adventures of Sabrina, and last year's Suspiria remake—have turned the witch into a metaphor for female empowerment, showcasing our complexities, our strengths, and our indulgent weaknesses. Witches have come to represent the actuality of being a woman in the modern world; a way to live out our desires in fantasy, to seek retribution on the systems that still hold us back. So again I ask, do we really need a movie that aligns a historically persecuted symbol with dated racism? It depends. Perhaps Zemeckis and producers Alfonso Cuarón and Guillermo del Toro are aware of this disparity and plan to update the story to address these concerns. A Southern gothic update could be a really neat way of recalibrating Dahl's quirkily creepy fable, as long as the female characters are handled with extreme care and aren't lazily pitted against one another. The fact that Black-ish creator Kenya Barris is reportedly co-writing the screenplay also has promise. Black-ish is a razor-sharp commentary on modern race issues, and Barris clearly understands how to talk about these things in a smart, cutting way. Dahl's book was accused of misogyny and banned in several libraries, with critics like Catherine Itzen noting that The Witches is a story that shows "how boys learn to become men who hate women," so Zemeckis and Barris will need to tread carefully with gender politics if they want to avoid those criticisms. Despite these concerns, I'mactually looking forward to The Witches. The original film is a perennial classic, and I'd love to see a new generation gifted an updated iteration of its nightmare imagery. Anne Hathaway is a great actress who proved in Alice in Wonderland how game she is to go big and have fun in fantasy roles. And Octavia Spencer, who is playing the protagonist's grandmother, is also an Oscar-winning talent who always brings the goods. Zemeckis still has a sharp visual eye, and as long as he veers away from the uncanny valley CGI that he's been a little too obsessed with recently, I know he has the ability to make this thing work. I just hope he does his witchy homework first.